There may have been some people surprised, but there were many, many others who predicted that ISIS would try and grab additional territory. Substitute Russia for ISIS and Ukraine for Iraq and you have Mitt Romney's comments on CBS' "Face the Nation" in March. Now, a mere seven months later, Americans are more scared of ISIL than they have been in decades of the Soviet Union/Russia. Even earlier this year, the fear of Ukraine or Russia paled in comparison to the perceived threat to the "homeland" from ISIL. In campaign 2012, Mitt Romney claimed Russia is "without question America's No. 1 geopolitical foe. "l As early as May, 2013, a mere six months later, journalist Michael Hirsh would smugly contend "So Mitt Romney actually had things right in 2012, when he inartfully labeled Russia "America's No. 1 geopolitical foe." And as recently as March 25, 2014 David Weigel (whom no one would accuse of being a Repub partisan) wrote "Romney was right," in arguing that Russia is a geopolitical threat while (Weigel maintained) "al-Qaida isn't a 'geopolitical threat' to the United States. It's a terrorist organization, untethered to states or geography." Republicans responded by implying (perception as reality, again), as reflected by tweets by three House members, he is not going far enough. Representative John Shimkus, albeit inaccurate on at least two levels, claimed "ISIS would not exist as it does if POTUS had listened to military commanders who warned against politically-motivated withdrawal from iraq." Reasonably, Majority Leader Kevin McCarthy commented "we must recognize ISIL is but a symptom of a broader terrorist threat that must be destroyed." Unreasonably, Michele Bachmannn remarked "The President gave a poll driven speech that has nothing in common with defeating a brutal enemy that has declared war on the United States" (missed that 'declaration of war," did you?). ISIL is primarily, if not exclusively, devoted to establishing a caliphate in the Middle East. Nevertheless, President Obama, virtually every Republican, and many congressional Democrats have suggested the organization poses a threat to the USA, and nary a public figure dare challenge that perception. Partly as a result, as Zach Beauchamp found, "A Sept. 23 Gallup poll found that 81 percent of Americans think ISIS is a 'critical' or 'important' threat to US 'vital interests.'" A Washington Post/ABC News survey published two weeks earlier had discovered 91 percent believing ISIS is at least a "serious" threat (again, perception, blah, blah, blah). repeatedly refused to answer whether she voted for Barack Obama for president. In an interview Thursday with the Louisville Courier-Journal editorial board simulcast on the Internet, Grimes was asked four times in less than a minute whether she voted for Obama in 2008 and 2012. “This election isn’t about the president. It’s about putting making sure we put Kentuckians back to work,” the Kentucky secretary of state said, when asked twice whether she voted for Obama. “Did you vote for him?” the board member asked a third time. “So, you’re not going to answer?” the board member asked. The Lexington Herald-Leader has also reported that Grimes last week declined to answer a reporter’s three questions about whether she voted for Obama. The incumbent McConnell immediately seized on the clip, noting that she was a delegate at the Democratic National Conventions in 2008 and 2012 and that she attended an inaugural ball for the president in Kentucky in 2013. 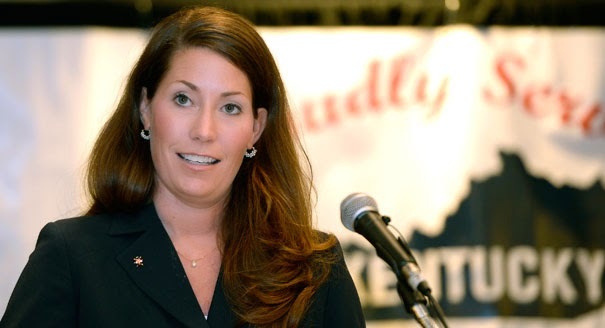 Alison Lundergan-Grimes should have expected to be asked, as a Democrat in a very conservative state, if she had voted for the guy she has spent the entire campaign distancing herself from. It may have not only been obvious but inevitable, precisely because as a convention delegate she supported Obama's opponent. But Lundergan Grimes- at least as of 7:01 AM eastern time Friday morning- hadn't come up with an answer. She might have pointed out that President Obama's opponent in 2012 minimized terrorism as a geopolitical threat. Voters would neglect to quibble over what constitutes a "geopoltical" threat while the Democrat would them that President Obama wants to destroy terrorists who appear to lop off peoples' heads for sheer entertainment (or to threaten the USA). Alternatively, she might have reminded voters that when Romney expressed his contempt for the 47%, he was talking about Kentuckians on Social Security, Medicare, or Medicaid. They include voters' mothers (especially) and fathers who otherwise could not be cared for, who are in eldercare facilities because of Medicare or Medicaid. If asked about 2008, Lundergan-Grimes could have noted that Sarah Palin- who has since quit her position as governor- wasn't qualified to be a hearbeat from the presidency. She might have suggested that she would have been more impressed if Joe Lieberman, perceived as a bi-partisan figure and clearly on John McCain's short list for V.P., had been McCain's running mate. Or she could have mentioned former Pennsylvania Governor Tom Ridge, on at least McCain's long list, who was a popular governor who earlier had earned several medals serving the nation in Vietnam. This should not have been difficult for someone who has been touted as a great candidate, one uniquely positioned to win a statewide race in Kentucky as a Democrat. The episode illustrates not only the challenges facing Lundergan-Grimes in Kentucky, but also the difficulty threading the needle when ignoring Harry Truman's advice.